18 W INTER 2018 PracticeLink.com 7 hospitals | 680+ physicians | 240 practice sites | 24 GME programs Equal Opportunity Employer - Minorities • Females • Protected Veterans • Individuals with Disabilities IT ALL HAPPENS If truly caring for patients and making a difference in the community is the reason you became a doctor, then join us in Virginia's Blue Ridge Mountains. You will feel right at home here with us. Reach out to us at 800-856-5206 or visit CarilionClinic.org/careers. contributors Jane Brannen is a copywriter at an advertising agency in Indianapolis, Indiana. She earned a master's degree from the University of Missouri, where she studied journalism and strategic communication. 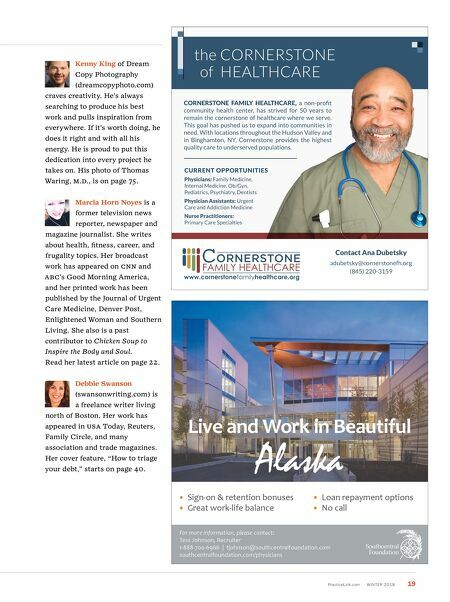 Brannen profiled opportunities for mission medicine on page 59. Taisia Gordon (taisiagordon.com) is a lifestyle photographer living in the rugged Missouri Ozarks. For more than 10 years, she has captured stories that inspire and brighten lives. Her photo of Frank Roam, D. o ., is on page 21. Stephen Ironside (ironsidephotography. com) is a freelance commercial and portrait photographer with an outdoor twist based in Fayetteville, Arkansas. When he's not eating Indian food or disappearing into the woods, he's usually contemplating how to become a traveling photographer for international N go s and nonprofits focused on cultural and environmental preservation. 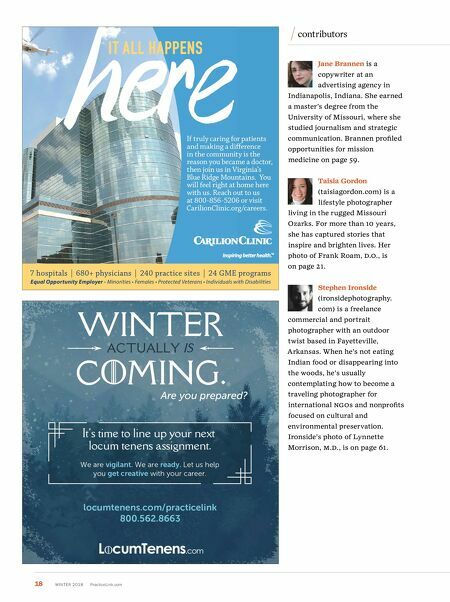 Ironside's photo of Lynnette Morrison, M.D., is on page 61.